The Sky glass custom photo locket necklace is a teardrop shape. 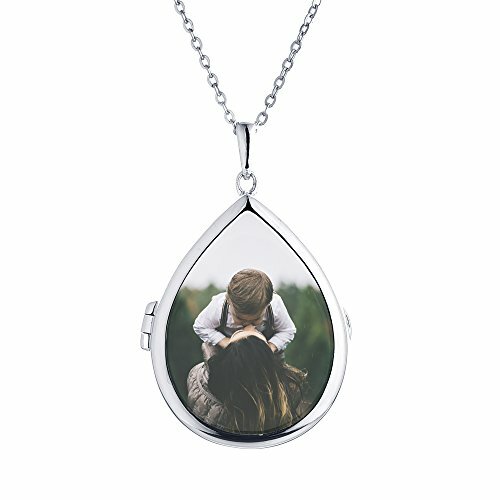 Outlined in Sterling Silver and can hold up to two of your favorite photos. Each time you glance at your favorite photo through this glass locket necklace, you'll know love is close. Sky is short for Schuyler and she is a warm, adorable and spunky girl, who our daughter, Olivia, considers her bestie. They have known each other since they were 6 and 9 months, respectively, and even better, their moms have known each other for almost 20 years. When we moved upstate, unbeknownst to us, they had already moved here and we picked our house AROUND the corner from them without knowing it. Since then, our families spend piles of time together and the girls, we know, will be lifelong friends. Includes Glass and Sterling Silver locket pendant and sterling silver cable chain. Available in chain lengths from 18" to 36". Our 18" through 34" necklace chains come standard with a 2" jump ring which may be used to shorten the chain by 2" and allows two length options. We put your picture in it! This unique custom photo heart locket necklace is the perfect gift. Use your favorite picture to personalize your jewelry for any occasion. We started with photos of antique lockets as our inspiration and recreated them in a way that felt both modern and vintage. The result is a collection of lockets that capture all the fine details and workmanship of a family heirloom in contemporary shapes and sizes. With You Lockets is a line of necklaces, pendants, and glass lockets all with a place to insert a special photo. Our keepsake lockets are comprised of 925 sterling silver, 14k yellow gold and 14k rose gold that hold photos. Produced with love and great care they are the perfect gift for celebrations, milestones, celebrations of life, memorials, bereavement, births, graduations, Mother's Day, valentine's day and Christmas. Like the memory they honor, they are something to be cherished.